Major League Baseball is celebrating Jackie Robinson, who became the league’s first African-American player on April 15, 1947. 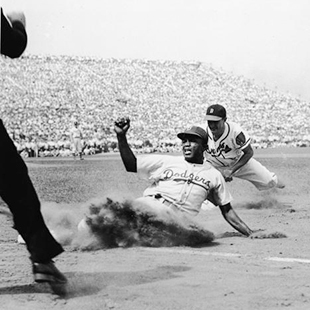 Robinson’s entry led the way to integrated teams and a steady rise in the number of professional black baseball players. However, in recent years, there has been growing concern about the declining share of black players in the league. The share of black MLB players reached a high of 18.7% in 1981, according to the Society for American Baseball Research. In 2014, 8.3% of players on opening day rosters were black. 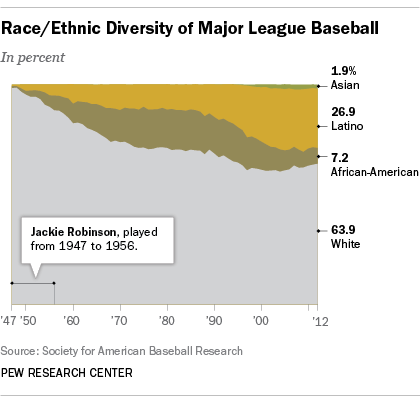 Before the most recent decade’s decline, the last time baseball had such a small share of black players was 1958. As the number of black players has declined, baseball has seen a rising share of white players, a trend that stands in stark contrast to the steady decline of whites as a share of the U.S. population. In 2012, the percentage of white ballplayers (63.9%) increased to levels last seen in 1995, when 64.5% of players were white. Historically, the share of white players has been shrinking since the color barrier was broken, bottoming out at 60.3% in 2004. Since then, the percentage of white players has trended upward. In 2012, blacks were underrepresented in baseball, making up 7.2% of players and 13% of the nation’s population. Asians made up 1.9% of players in 2012 and 5% of the U.S. population. In 1993, there were no Asians in Major League Baseball, according to the baseball research group. It’s worth noting that the majority of Asian (80%) and Hispanic (84%) players in 2012 were born outside the 50 U.S. states and the District of Columbia (i.e. foreign born or born in a U.S. territory like Puerto Rico), according to the Society for American Baseball Research. In 2014, some 223 players, or 26%, were born outside of the 50 U.S. states and District of Columbia. The largest number of players come from Latin America. The Dominican Republic leads the way with 82 players, followed by Venezuela (59) and Cuba (19). Puerto Rico had 11 players. Among Asian countries, Japan (9) had the most players, followed by South Korea (2) and Taiwan (2).